Look at my new avatar!!! As soon as i saw it i had to have it. And I'm shure you were bored of the old one i had scince I began 1 month ago. Idacate pricisely waht you mean to say, yours sinceerely, wasting away. Have a fun and safe celebration. I'll be hoisting a Corona or two in your direction this evening. If you have chance to watch the light show and fireworks from the Zocalo last night on the news on TV, do it. They were awesome. ¡¡VIVA PEDRO INFANTE Y JORGE NEGRETE!! ¡¡¡¡ABAJO EL PERREO, EL RUMBEO Y EL REGGAETON!!!! Wow Miss Lizzy you really know about Mexican true heroes. And Prudence, don't let others decide how you are. I know it's hard but try to ignore them. Viva Mexico y The Beatles! Well, mithveaen - how is your head this morning? It is Joe. Is it true that those are the guys favorite colors? 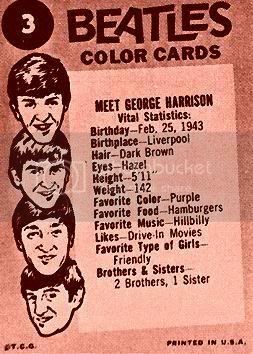 I mean, John's favorite is green, Paul's blue, George's purple and Ringo's red? Glad you liked it. I made it for a sun protection campaign in my blog and newsletter (I'm a dermatologist). Please, feel free to use it, share it, spread it... That's the reason I made it for! 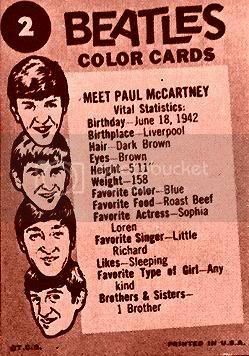 P.S... Paul Mc Cartney: Favorite food: ROAST BEEF!! And my head is better Zig. My Dad is angry with me though, he said I should be eating healthy food, not drinking tequila. Oh and Miss Lizzy, my sunscreen lotion is Lancome but I'd be glad to change to a Beatle sponsored!! The ad is very clever! and they got what they wanted. and we still are rocking. Happy 4th of July! Do any of you have big plans for today? I've been mowing like a dog. I need to sleep like a log this afternoon so I can drive my dog around tonight to be away from the sound of firecrackers. You could buy your dog some dog earmuffs @Ahhh Girl. I plan to do nothing, mainly as I'm not American. I already tried to take down the sky, didn't work. Just hanging out with family, watching Twilight Zone, fireworks later.